The Hot 70-F Pickup Set will give you sweet cleans to full-throttle crunch - noise free. The EMG Retro Active Hot 70 set utilizes Ceramic magnets in the bridge and Alnico 5 in the neck producing high output, Van Halen and ZZ Top-like tone of the late 70’s. This traditional open-coil design set has a vintage look that players love. Each pickup is outfitted with a uniquely voiced plug-in FET preamp, giving you low-impedance output while alleviating virtually all noise, hum and buzz common in passive pickups. The outputs are voiced to give you an even volume between the neck and bridge for smooth pickup transitions. This powerful pickup set is available in black, zebra and black/red zebra. The Hot 70 set delivers all the passive feel and dynamic response of traditional passive humbuckers, combined with all the advantages of active technology. Complete versatility is at your fingertips from the biggest rock tones to the sweetest cleans and everything between. The past has never sounded so good. Spaced for guitars with a Floyd Rose Tremolo. 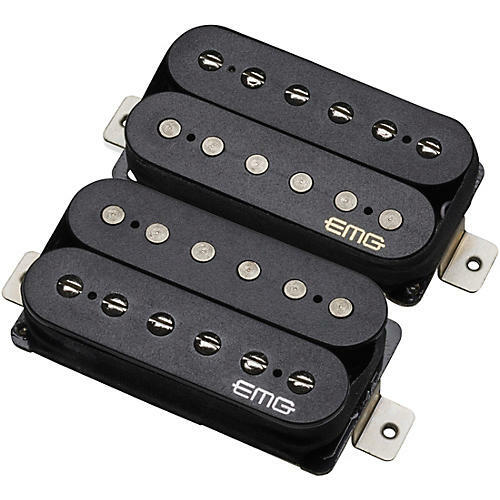 Get the clarity that a humbucking pickup was designed to have in the beginning with the EMG Hot 70-F Pickup set. Order today.